For A FREE Low Cost Office Furniture Quote Call 713-412-0900 today! If you’ve recently launched a new company as a startup, it’s highly important to get the best prices for all of your expenses, and that can’t be truer in the case of finding low-cost office furniture. Having the right furniture can mean a lot to a new business, particularly in the realm of first impressions, where visitor customers can get a real glimpse into how you and your staff operate. Well-built furniture is right up there with other essential features of an impressive office, including quality lighting and ergonomically-designed chairs. Luckily, low-cost office furniture doesn’t have to mean low-quality office furniture. No matter what your size or your industry, our low-cost office furniture offers a nearly infinite number of custom possibilities to meet any of your unique business and workflow needs, all without going over your budget. This can be said for both our new and custom-built pieces as well as using pieces that we’ve refurbished in our very own repair facility. 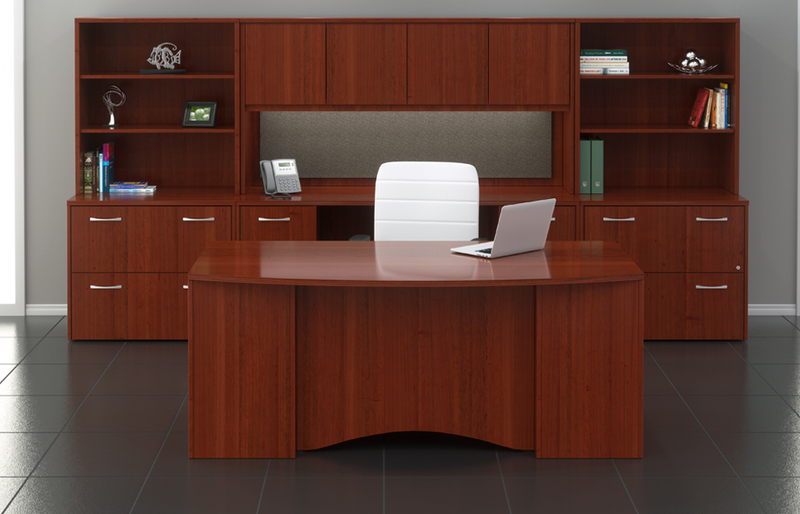 One major way that you can opt for low-cost office furniture is in terms of materials. It goes without saying that a range of materials will yield a diverse set of cost implications, not just in terms of how a given material was obtained, transported, and processed, but in how it’s used and by whom. For instance, while most people do love to see the presence of wood furniture due to the feelings of comfort and warmth that they stir up, its high cost makes it a good idea to replace it with an alternative that uses wood veneers, which don’t only showcase the beautiful wood-grain pattern of real wood but also has excellent portability, durability, and impact resistance. In this way, low-cost office furniture can be beautiful without blowing your budget. You can even step away from wood altogether and add a unique sense of personal style or company identity with the many colors and patterns available through relatively inexpensive yet very dense and durable high-pressure laminates. Consideration of storage features and other details can also help to transform potentially expensive purchases into low-cost office furniture options. No matter what kind of furnishing it is, the inclusion of features and other detailing will generally drive up the cost of your furniture. With decorative detailing—such as scroll-work and tooled edges–and organizational features with their requisite operational hardware, you can expect to see higher overall production costs. On the other hand, lower price doesn’t always mean more value, that’s why it’s important to shop smart for your low-cost office furniture, such as making sure to assess aspects of your company, physical work-space, and personal work style. Does putting your personal items in a storage locker keep your space uncluttered and functional? Is task lighting available in a spot where you typically do visual work? Can a tack board help keep important notes at the forefront of your mind? With this knowledge, a feature you choose to keep may add to the price tag but simultaneously add a sense of value in your morale and productivity. The occasional meeting among office workers for business or break purposes, the individual need to stay on task at one’s workstation, or the regular job interview with prospective employees—we all know the importance of communication in the workplace and low-cost office furniture can play a role in that. The quality of communication among many or focus within one can make or break client relationships, flip project outcomes, and spell the overall success or failure of a business. This is why acoustical and even visual privacy for further well-being is a must. Unfortunately, some startups find themselves subleasing an office lacks the conventional, sheet-rocked spaces that would otherwise provide that kind privacy. When it’s simply not feasible to undertake your own construction, your office can still benefit greatly from easy-to-assemble low-cost office furniture that Cubiture carries. The cubicle is probably one of the most popular furnishings to address many of the above privacy problems that can plague workplaces today due to its ability to save on cost and space. At the same time it seems to be one of the most reviled elements in the office as well. Whatever your opinion on the cubicle, it is no doubt a major fixture among low-cost office furniture solutions today and going nowhere anytime soon. This has everything to do with its highly-configurable, kit-of-parts nature. Any element can have a nearly infinite number of variants along the lines of size, material, finish, color, grade, and of course price point and available features, to name a few. Panels can vary in height and also provide maximum acoustical and visual privacy in the multiple fabric options available. Also among our privacy-friendly low-cost office furniture are our stack-able panels that can be configured to create cubicle-like spaces of various sizes and material finishes such as laminate, fabric, glass, and metal. Thanks to the building method, these panels can shape those communal spaces that require privacy even without the support of surrounding structural elements. Include a sliding door to give your space a more conventional, private feel. At Cubiture, we work closely with you to decide on what low-cost office furniture would best meet your business and office needs while being attractive and quality-built as well. We provide our customers with maximum value in our services, including free consultations and free estimates with no obligation to buy. We also strive towards short lead times when delivering your low-cost office furniture with the added benefit of free shipping as well as continued maintenance and repair programs. To discuss all of these points more in-depth, don’t hesitate to call Cubiture at (713) 412-0900 today!